If you are looking to experience the iHub without committing to a full year, our Term Taster Package is the ideal place to start. For a one-off cost of £185, you will receive 13 weeks’ full access for you and 35 pupils across as many classes as you wish, plus one copy of newspaper delivered every week. As we want you to get as much value as possible out of your Term Taster Package, our team will set up your classes for you and throughout the 13 weeks you can benefit from free support, available on weekdays, 8:30am to 4:30pm, to ensure you have all the guidance you need. A member of the team will be in touch to arrange your account set up and arrange an invoice of £185 + VAT to be sent to the address you provide below. The Bett award-winning iHub is the most effective way to engage your Key Stage 2 and 3 pupils with interactive comprehensions, vocabulary puzzles, polls and debates. 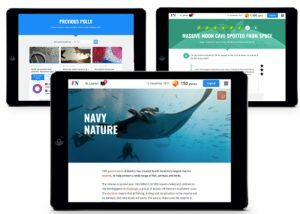 The iHub is an invaluable tool to develop pupils’ core literacy skills through the exploration of global news stories, delivered through tailored learning based on pupil’s individual reading levels.